Reigning champions Real Madrid will face Bayern Munich while Barcelona have drawn Juventus in the Champions League quarter-final draw. 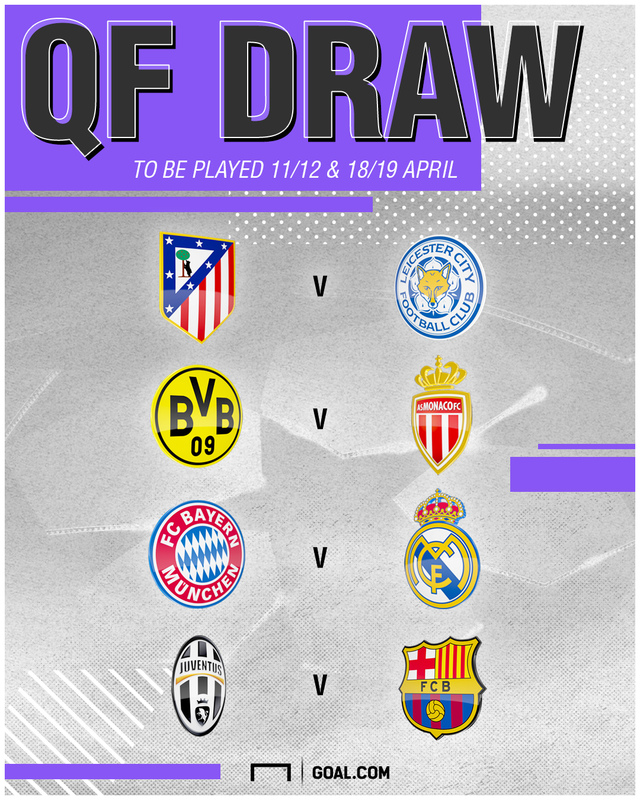 Leicester City, meanwhile, will face Atletico Madrid in a daunting tie for Craig Shakespeare's Premier League champions, while Borussia Dortmund will take on Manchester City's conquerors AS Monaco. Real progressed to the quarter-finals by virtue of a straightforward aggregate victory over Napoli, but they will have their work cut out against the German giants, who thumped Arsenal 10-2 on aggregate, winning each game 5-1. Barca may feel that this is their year after a quite staggering victory over PSG; the Catalan club recovered from a 4-0 defeat in the first leg, prior to their amazing 6-1 win at Camp Nou. Juventus, meanwhile, beat FC Porto 3-0 on aggregate to progress, while Leicester defeated Sevilla over two legs in one of the most historic victories in the Foxes' history. Juventus and Barcelona faced off in the 2015 Champions League final, with Barca running out comfortable 3-1 winners, but former winger Pavel Nedved believes Juve have improved since then. "It's a fascinating challenge, against one of the most famous clubs in the world," he told Sky Sport Italia. "It's really beautiful but we must now look to the past but the present, knowing that they are strong. The best team will win. "In my opinion, we have definitely grown (since 2015 final). I believe that maybe this game is coming at the right moment for us. We have to respect Barcleona but not too much because that leads to fear and that's not good. I believe that our team is at the same level as Barcelona. "Leonardo Bonucci and Paulo Dybala wanted Barca, but Dani Alves wanted to avoid them. We can be content because to be here as the only Italian team in the Champions League quarter finals makes me proud. But I would prefer if there were others. Italy needs that." Atletico, though, present a quite different threat, as they look to again reach the Champions League final. Diego SImeone's men reached the showpiece game in both 2014 and 2016, and defeated Bayer Leverkusen to reach this stage. Monaco produced a stunning result to beat Manchester City, winning 3-1 at home after falling to a 5-3 away defeat, meaning they progressed on away goals at the expense of Pep Guardiola's side, and they will face a free-scoring Dortmund. Following a 1-0 defeat to Benfica in the first leg, Thomas Tuchel's men won 4-0 at home to seal their progression, and they will hope to outwit the Principality-based outfit.